The Tourist Board of Vitoria-Gasteiz City Hall is making a big effort to promote the highest standards in tourism sector in the Basque Country capital. As part of this effort they have recently prepared and published a list with all the services the city is offering for tourists: Gourmet Workshops to Nature walks and of course, Tourguides. In the first of this list, you can find the contact details of Aitor Delgado Private Tour Guide. 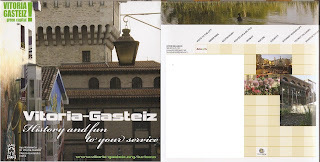 I wanted to express my gratitude in today post for that leaflet that Vitoria-Gasteiz City Hall published. You can see in this picture above a copy of this document that you can find in the Tourism Office Board, the Hotels, Museums and many other places in the city of Vitoria-Gasteiz.